As my regular reader may have noticed, the cheque’s in the post, I am doing a series of articles on Farmers’ Markets and so using the opportunity to do some Let’s Do Lunches in the suburbs on the market days. They are held over weekends and so the lunch spots will probably have a different vibe from those in the City Centre on working days. The first one on the list is Hessian at Oakwood. I have fond memories of Oakwood as I lived there in the late 1960s and it was on TV there that I watched Neil Armstrong walk on the Moon and where, just over a year later, I celebrated my 21st Birthday. I was one of those individuals caught in the gap when the age of majority was lowered from 21 to 18 so when I was 18 it was just another birthday, apart from being able legally to drink. I found this ruined the taste of the beer I had been illicitly knocking back in my local for a year or two, and my 21st also meant nothing in legal terms either. I also used to work as a relief manager for a group of betting shops and spent a bit of time at the Oakwood branch, which I enjoyed. The only things which have changed since then are the building of Cafe Sylva, which is a wonderful looking building and blends in so well with the copse which surrounds it that you would think it had been there forever; and the names above the premises. The betting shop has gone, as has the upmarket ladies’ hairdresser which was next door and whose freshly coiffed clients would sometimes pop in for a sneaky punt. Most of the ‘new’ businesses seem to be bars and restaurants, so I had plenty of choice. The establishment I chose to visit was Hessian, a cafe bar which seems to be very popular with the locals as I had the last available table. Hessian Oakwood. All photographs by Stan Graham. There is a special lunch menu but the blackboard had some specials so I thought I would go for one of those. 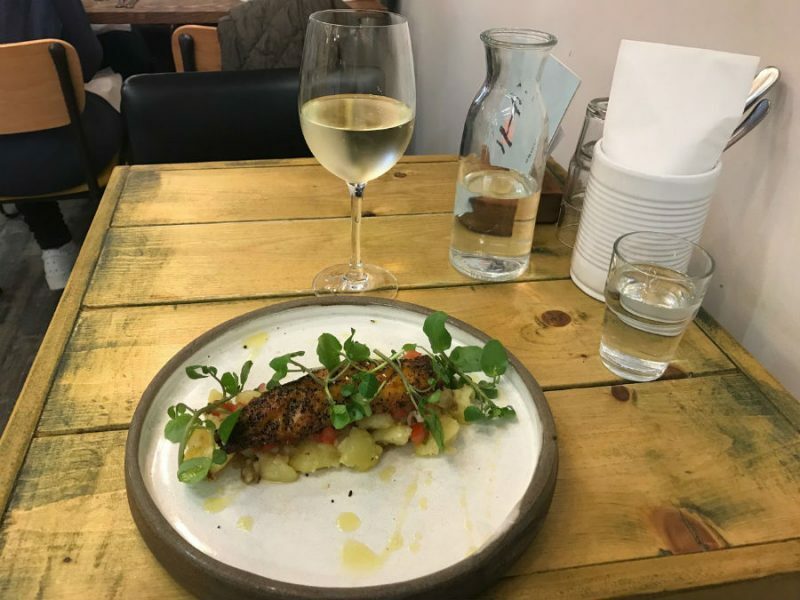 I opted for Hot Smoked Mackerel with Smashed New Potatoes, Watercress and Tomato Salsa at £7.50. To keep it company I ordered a glass of Picpoul de Pinet (£6.40 for 175ml) which was nicely chilled without being freezing cold. I was pleased to see that the high standard of service so prevalent in the City Centre restaurants and bars is also present here. I was guided to my table and offered a carafe of tap water whilst I decided what to eat, which was nice, and the table didn’t seem to be allocated to a specific member of the waiting staff as any of them who passed made sure that food was delivered, plates and glasses taken away when finished with and my wellbeing catered for. I would imagine that some of them were Saturday staff but, if so, you wouldn’t have guessed as they were all very professional, and friendly too. The fish was well presented but perhaps a tad dry although not enough to spoil it. The fillet was on the small side so a bit more difficult to get spot on than a thicker piece would have been. The potatoes were perfect, cooked through but still firm enough to be crushed rather than overdone, which would have caused them to have been mashed. The salsa added a welcome refreshing note and the whole combination worked very well. Watercress is always a good peppery addition to fish, but in this case was more of a complementary taste than a contrast, as the mackerel had been peppered before cooking. 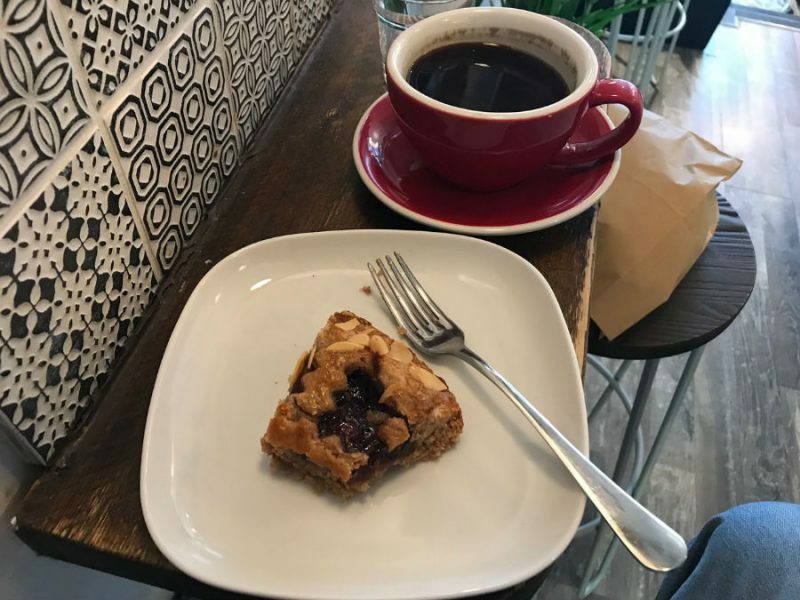 I vacated my table to have a black Americano, £2.70, at the counter as the place was filling up again and I felt guilty about occupying a whole table when there were diners waiting. My good intentions to forego a dessert came to nothing, yet again, when I saw the Jam and Almond Cake on display at £3.00. It was amazing, with the pastry being dense but beautifully light. There were flaked almonds decorating it so should you have a nut allergy I’ll have your piece! 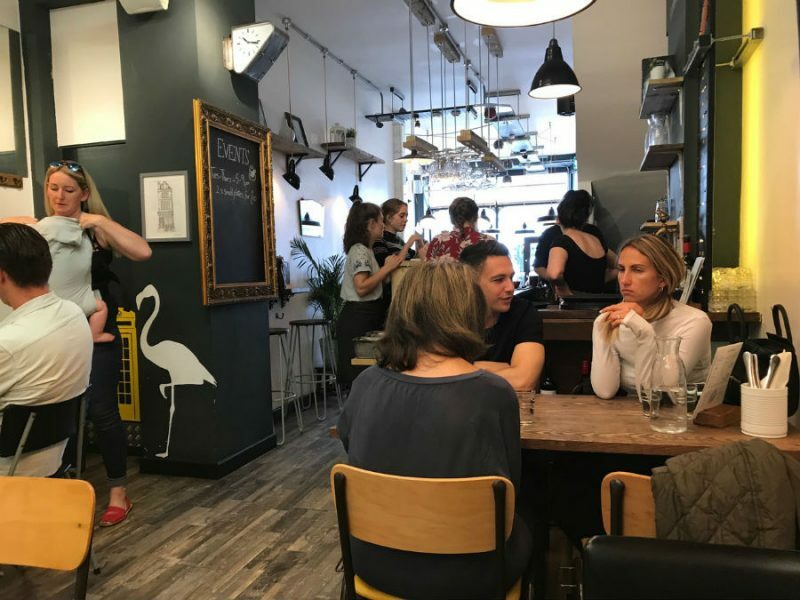 I was right about the Saturday vibe, with the place being residence to mainly young couples with their children, a real family atmosphere which makes lunch a laid-back event rather than what can be a frenetic experience in the business quarter of Leeds. Oakwood has morphed from being a dormitory suburb of Leeds into what seems like a destination in its own right, and with the wonderful Roundhay Park slap next door, why not? If these places had been open in 1969 I wouldn’t have had to freeze waiting under the clock for my friends to get the bus into Leeds; we would have lurked locally and had our beer from the ‘wood.